Saturday, May 18th at 8 a.m. The Fallbrook Church Combat Ready Cancer Ministry wants to improve the lives of men, women, and children affected by cancer through educating, equipping and encouraging both the patient and care-taker through biblical training and support. In order to raise funds to service individuals who have been affected, the ministry will host an all cancer walk. After submitting this form, you will be redirected to our online bookstore for payment. Co-host of ministry events, large logo included on pop-up banner, 5 walk registrations, 5 event t-shirts, vendor booth at walk/run with mile marker, 2 minute presentation at walk. Co-sponsor of ministry events, medium logo included on pop-up banner, 4 walk registrations, 4 event t-shirts, and vendor booth at walk with mile marker. Underwriter, small logo included on pop-up banner, 3 walk registrations, 3 event t-shirts, and walk marker. Supporter sponsor list on pop-up banner, 3 walk registrations, 3 event t-shirts, and walk marker. 3 walk registrations, 3 event t-shirts with sponsor recognition. 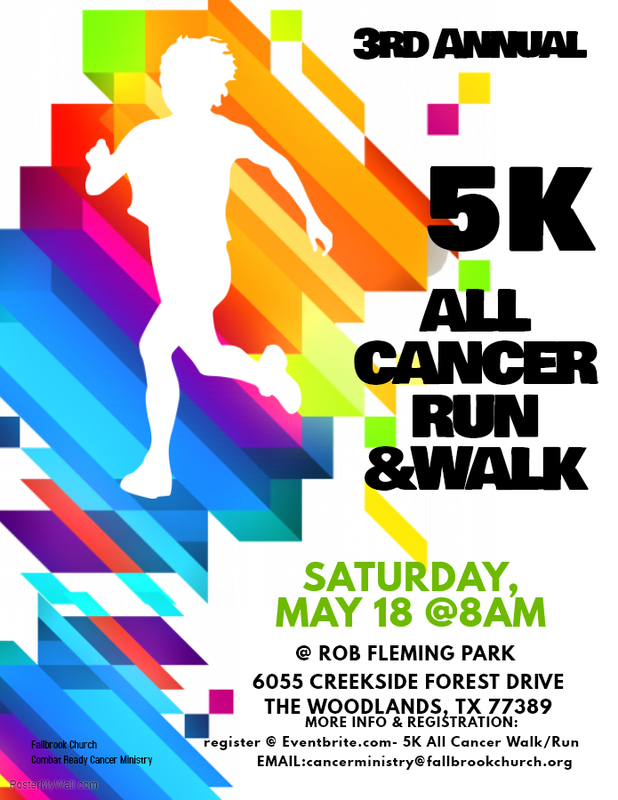 2 walk registrations, 2 event t-shirts with sponsor recognition. All donations are tax deductible and will support the mission of the ministry.